We might think we know the truth about Earth’s ancient history but it isn’t so. Whistleblower Corey Goode claims to have spent 20 years enrolled in secret space programs and covert government operations. During this period, he witnessed a multitude of extremely bizarre events and visited places we never even knew existed. One of the most interesting of them was an underground chamber where ancient giants were being kept in suspended animation, since times immemorial. According to Goode, the chamber was constructed by the Ancient Builder Race, and the hibernating giants were the last of their kind. At the time of its disappearance, this civilization possessed technological capabilities that far surpass our own. The stasis chambers were a testament to their progress, as they employed crystal technology that allegedly altered the flow of time. Thirty thousand years could pass, but for the crystal capsule’s occupant, it would only seem like thirty minutes. The technology to create and maintain time bubbles is something humans aspire to one day possess but, according to Goode, it has been present on Earth for thousands of years. […]there was this one location that, back in the 1800s even, people were going from certain—I guess people would call them Illuminati or other elite groups—they were going to visit this one area that was kind of like a grotto, or an underground cave. In between the three sarcophagi was a cube-shaped pedestal holding “a blue glowing crystal matrix with like a spider web connecting it to the four corners, suspending it.” Goode said this crystal was responsible for creating and maintaining the time bubble. And the mystery goes deeper. Goode recalled that the giant humanoids appeared to have squeezed themselves into the sarcophagi on account of being too tall. By the looks of it, the stasis chamber had been originally built by some other beings and the giants were intruders. They had simply taken advantage of the ancient high tech. 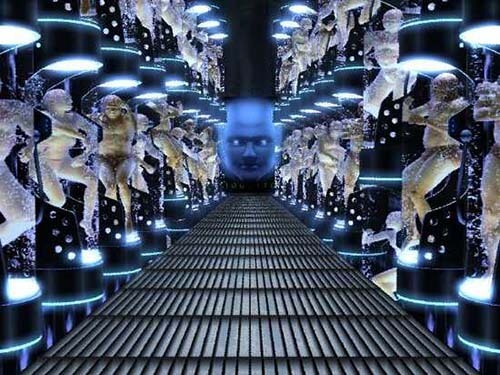 No-one knows who they were or where they came from, but Goode claimed there are countless other giants in stasis chambers all over the world. All over—yes, all over the planet. In some areas, some of the beings they found in stasis were of a different ethnic group that had, I guess, found these technologies and learned to use them. But these tall, red-headed, red-bearded groups were only found in Europe and the Americas. 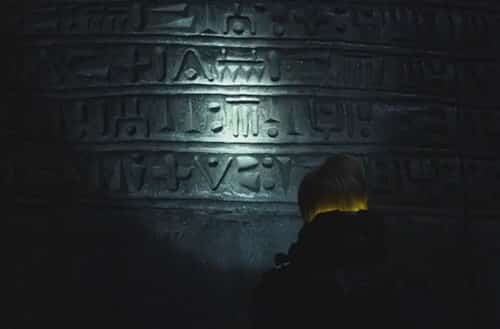 Its interesting to note the other items present in the sarcophagus, such as the gold fish engraved with Sumerian cuneiform symbols. Goode claimed that it wasn’t unusual for them to find such artifacts and he noted that ancient Egyptian and Hindu symbols were also present on the walls of other stasis chambers. And those weren’t the only out-of-place inscriptions. You might be wondering how on Earth did Corey Goode come by this information and his answer adds a few more layers to this weird puzzle. 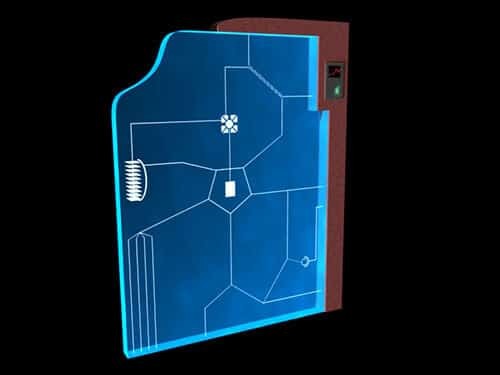 While serving in the Secret Space Program, he would routinely analyze information on what he called “smart glass pads.” These glass pads were as old as the stasis chambers themselves and served as ancient encyclopedias providing information about our planet’s secret past, extraterrestrial visitations and various alien technologies. Goode’s disclosure, however intriguing, raises a few questions regarding legitimacy, the most pervasive of them being: can we trust him? Some of his claims seem to be verified by the discovery of giant skeletons all over the world. Whenever possible, these discoveries were kept secret or suppressed by the powers in charge. There are virtually hundreds of reports of unusually large humanoid remains being found but physical evidence is almost impossible to come by. At the moment, Goode has no evidence to back up his claims. Perhaps this will change in the future, when the giants awaken or the Ancient Builders return, whichever comes first. Previous Article← The time before 3000 BC, the date when the first official Pharaoh appeared in Egypt is a great enigma.